The Walking Dead is an episodic graphical adventure game developed and published by Telltale Games. It was originally released in episodes on the PC, PS3 and Xbox 360 and is now available complete on those systems and the PS Vita, which is the version reviewed. 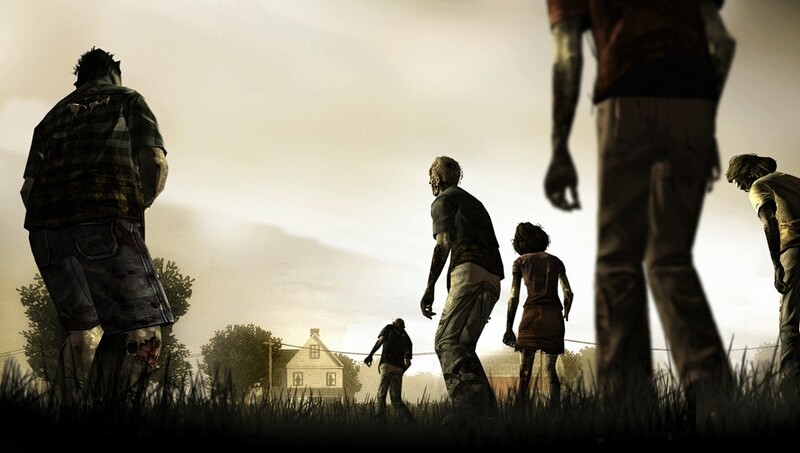 The game follows a new protagonist, Lee Everett, a university professor and convicted murderer as he is caught up in the zombie outbreak. 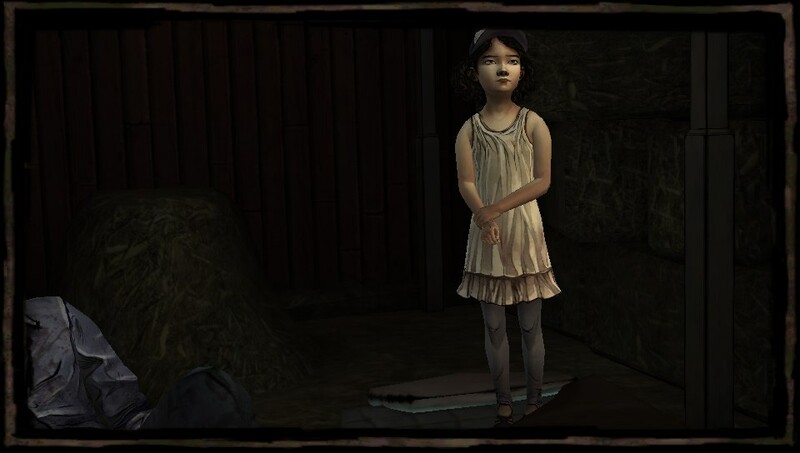 He rescues a young girl named Clementine and serves as her guardian throughout the game. Although this is a original story that is only shares a setting with the original comic/TV series, Lee does encounter some characters from the comic, though most are unique to the game. 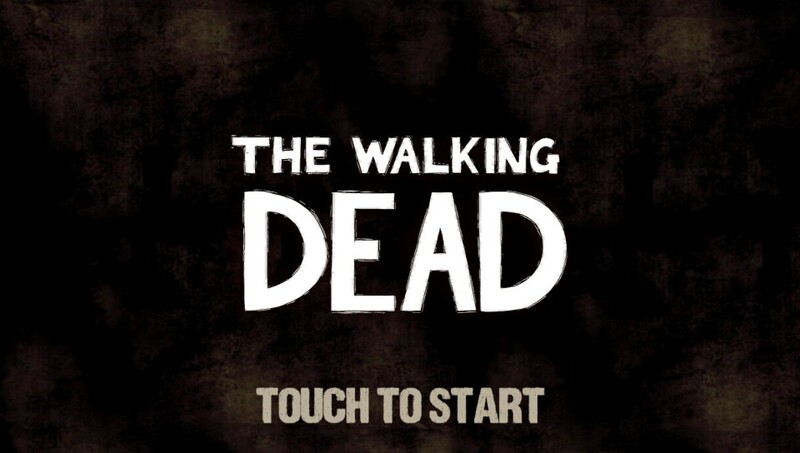 The gameplay consists of moving the character through the environment and interacting with it using the touch screen. Combat is done the same way, with you touching the screen to load a weapon or tapping the enemy on screen. The majority of the game is solving puzzles or interacting with the environment in order to move on. The game is heavy with dialogue, giving you multiple choices for response, each affecting how others react to you during the game. The choices are time sensitive; if you do not respond in time, the game goes on as if you refused to answer the question. Your dialogue choices affect how others react to you. The game is broken down into 5 “episodes” that you play through. As you go through the game, it keeps track of your decisions, with can help or hinder you later on. How Lee handles himself and his response and actions affect how the others react to him. All these decisions add up by the beginning of the last episode. Clementine is the little girl Lee decides to protect. I am only through episode one but I can tell you that this is a good game. I have played games fro Telltale before (such as their Sam & Max games) and they are always entertaining. The Walking Dead seems like a good fix for this type of game and it has done well enough to warrant another “Season” of games. I highly recommend this game for any of your systems, but if you have a PS Vita, get it for that system, or if you don’t, by the PS Vita Walking Dead bundle. 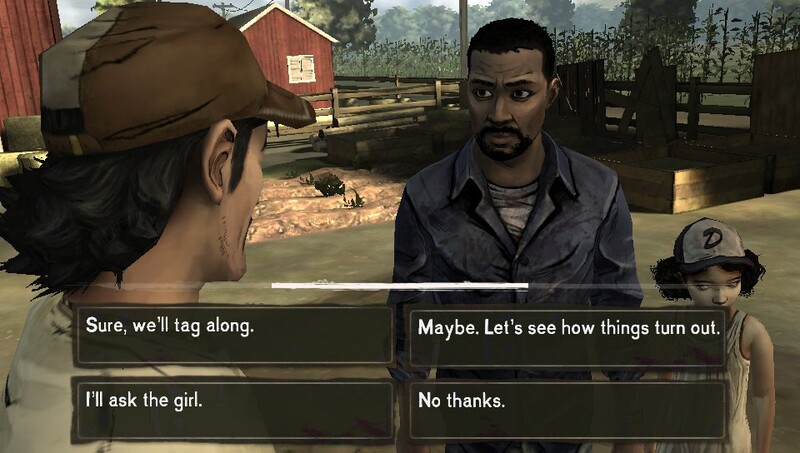 I would like to see Telltale bring more of these game to the Vita. The Walking Dead is Rated M for Mature. 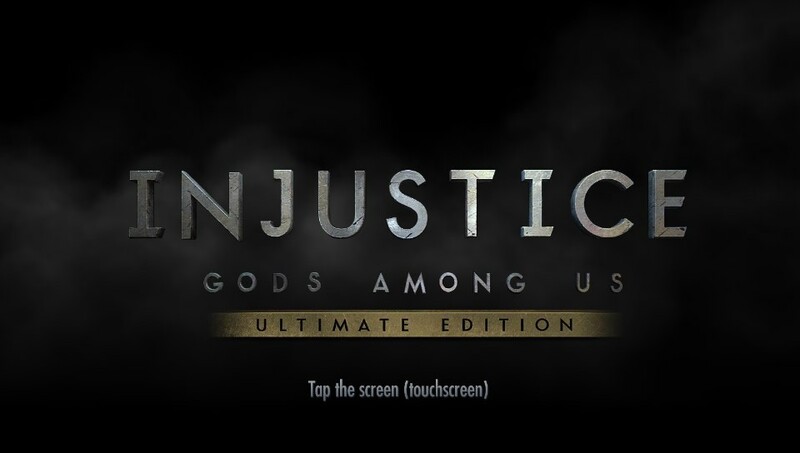 INJUSTICE: Gods Amongst Us Ultimate Edition is a fighting game developed by NetherRealm Studios (Creators of Mortal Kombat) and published by WB Interactive Entertainment. It is an updated version of the game released earlier in 2013 with all of the DLC add-on characters and costumes included. It was released for the PS VIta, PS3 and Xbox 360. with verson for PS4 and Xbox One released after those systems launch. This review is for the PS Vita version. The heroes (and Harley) as they appear in game. This costume almost makes Harley’s New 52 get-up look modest. 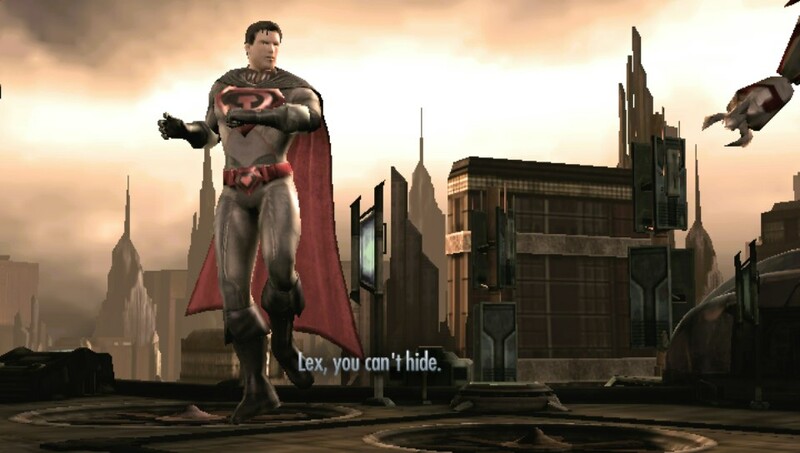 The games story mode revolves around members of the Justice League being transported into a parallel word in which their counterparts have taken over the world under Superman’s direction. The heroes must team up with that world’s Batman and his insurgency (including Deathstroke, Harley Quinn and Lex Luthor) to free the world from Superman’s One World Government, even if it means fighting those who, in their own world, would be their allies. The story is told through fully acted cut scenes. 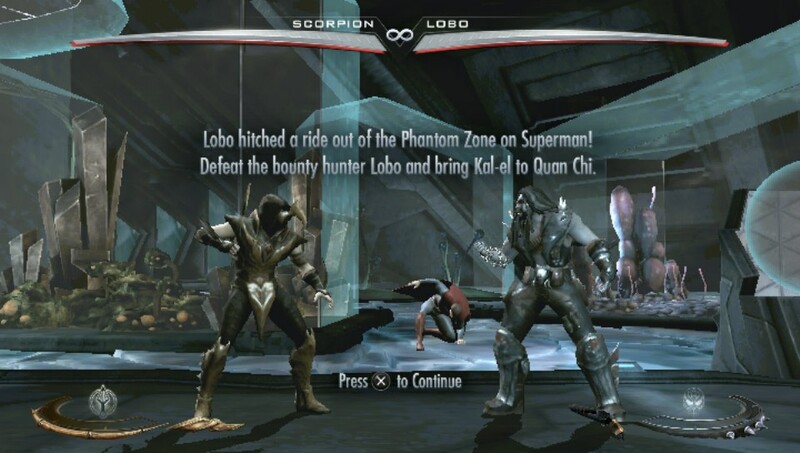 The gameplay is similar to the Mortal Kombat series but with some changes. There are three attack buttons (light, medium and heavy) that do various moves with directional input and well as a power button, which is dependant on what character you are using (Batman summons flying bat drones, Green Arrow shoots a trick arrow, Flash moves fast enough to slow time, etc.) There is a super meter which is filled by doing combos or being hit. Once charged to a certain point, it can by used to do more powerful attacks or be wagered against the opponent in what is called a Clash. 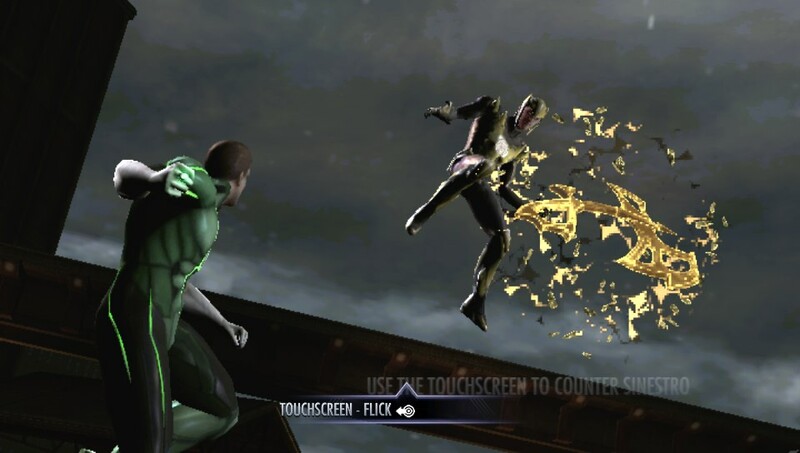 Instead of Fatalities, Injustice uses a Special attack which can be sued with a full Super meter. This unleashes a character-specific special attack which are the most devastating attack. Scorpion and Lobo square off. The game also includes S.T.A.R. Labs missions, a group of special character specific challenges. Each follow a specific story line for each of the game’s characters and range from standard fights, performing specific moves, avoiding taking a hit or little mini-games like avoiding asteroids or shooting down missiles. All missions start unlocked in the Ultimate Edition. This version also includes all of the DLC for the original. In addition to the regular 24 characters, there are 6 characters from the DLC, Lobo, Batgirl, Zatanna, Zod, Martian Manhunter and, from Mortal Kombat, Scorpion. Each of these characters also get their own set of S.T.A.R. Lab missions. Also included are the various character skin DLC, referencing different versions of the characters (i.e. New 52 Batman, Earth-2 Flash (New 52), Red Son Superman and Ame-Comi Wonder Woman.) Only the Red Son inspired versions of Superman, Wonder Woman and Solomon Grundy have their own S.T.A.R. Lab missions. 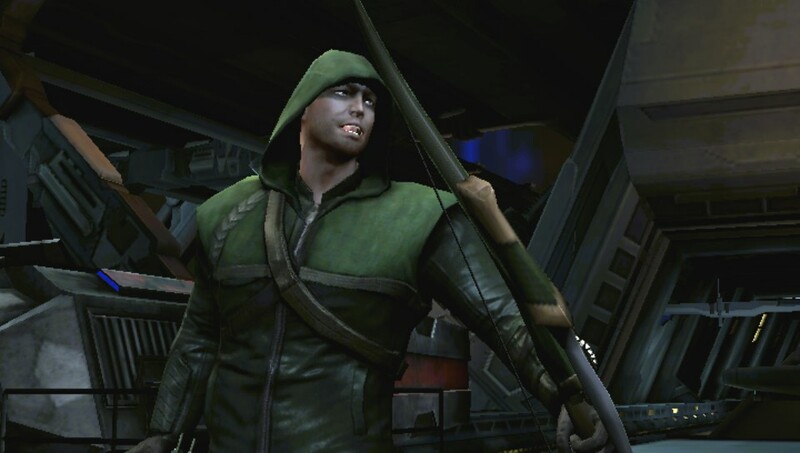 Previously DLC skins like this ARROW-inspired Green Arrow skins are included and are unlocked. Bonus for this one: The voice changes over to Stephen Amell’s. The game looks good on the PS Vita, although, some times the font is a little small to read on the screen. The characters look great and the action runs smoothly. The game controls like the big system counterparts, except that the Quick Time Events (QTE) in he story move and in the S.T.A.R. Lab missions are controlled by the front touch screen. Again, sometimes the prompts are a bit too small for my taste. 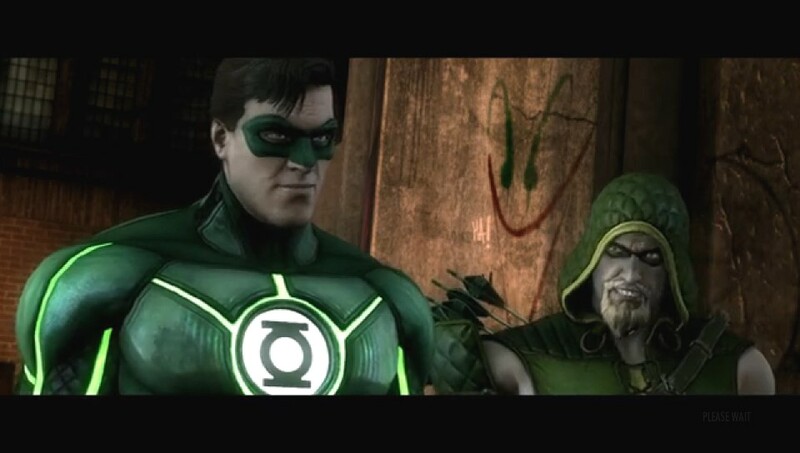 Green Lantern and Sinestro during a QTE . Overall, the game works well on the Vita. Fans of Fighting games and the DC Universe will enjoy this version. As this is the only version on the PS Vita, it won’t be like your buying the game again just to be a completest. It is a good choice for those who want a new fighting game for their portable system. 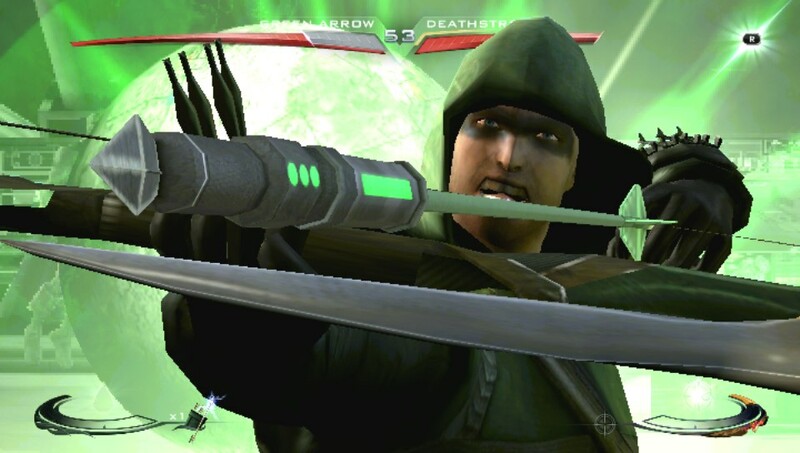 Green Arrow/Arrow enters his Special Attack! 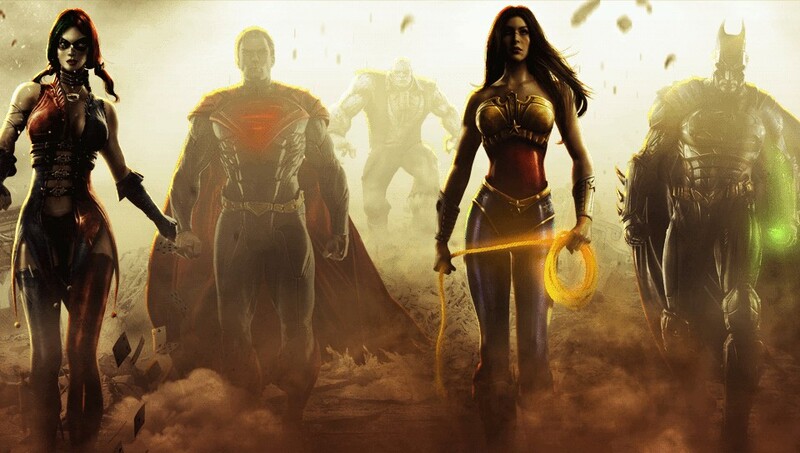 INJUSTICE: GODS AMONGST US Ultimate Edition is available now on the PS Vita (both physically and digitally) and retails for $39.99 at most stores. The games is also out for the Xbox 360, PS3, PS4, and PC. It is Rated T for TEEN.